Ever dunked your favorite cinnamon doughnut in coffee? Our toughest testing critics give this fusion of deliciousness 5 stars. We hope you love it too. Full flavor, high VG, equipment friendly. Ingredients Include: Propylene Glycol (USP Grade), Glycerine (USP Grade), FEMA/GRAS approved natural and/or artificial flavoring and optional nicotine. I ordered a 17 ml on a whim and so glad I did. Think of a fresh hot donut rolled in cinnamon sugar, left to rest then rolled in more; take a bite and a sip of coffee and imagine the flavors coming together so deliciously in your mouth. The cinnamon is not overpowering so as to "burn" your tongue...it's perfectly balanced, perfectly delicious! I got this as a free sample and would not of thought to get this flavor. I really like it me and my friends think it tastes like Rum Chata great vape will be buying more. Taste is spot on as advertised. 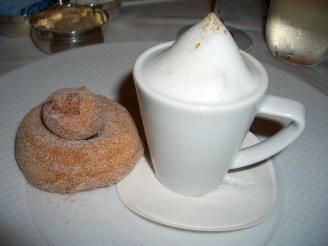 Cinnamon, doughnut and coffee. The coffee is subtle and the cinnamon is rich bakery and not too heavy. I got a free sample then ordered a 30ml and back for the 130ml. I love this juice.